Come stay at the 'SAND HOME', only a block from Mackerel cove beach. This home is a family friendly, fun and easy. 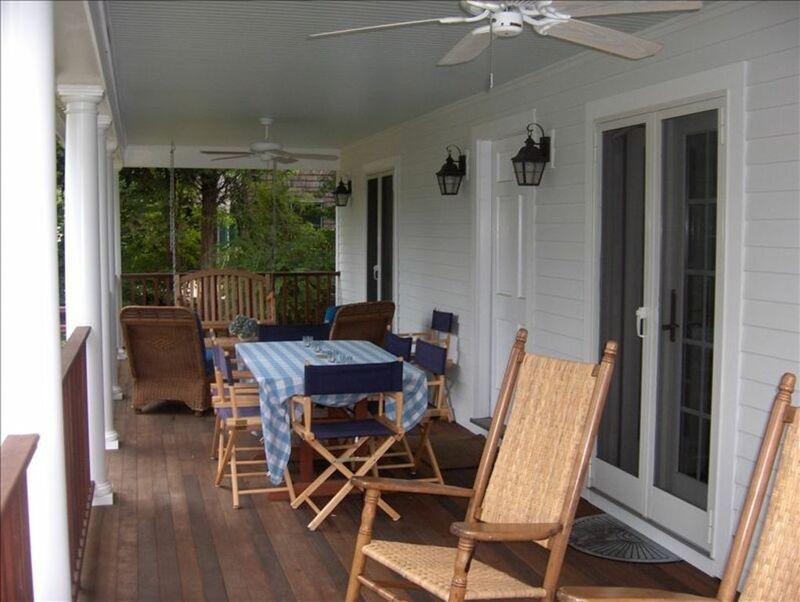 With its large, comfortable front porch, relaxing on a rocking chair or swing makes sunset a special time for all. There is also a dinner table for 10. The yard is a flat, well manicured 1/2 acre, great for ball, Frisbee, or flashlight tag. Also, for the kids, a swing set w/climbing wall/picnic table/sandbox, and the best climbing tree!! For the adults, there is a large hammock and adirondac chairs to watch all the fun. The outdoor shower has hot and cold water and is great for late night showers under the stars. Recently renovated, the upstairs has three bedrooms, 2 with skylights for stargazing, French doors to small private porches great for an afternoon read or sunset. the 2nd floor also has a claw foot slipper tub for a long soak, or a hand held shower head to wash the kids. The whole house is white, bright, and clean, it is decorated with nautical accents and comfortable furnishings. Our family stayed here for our daughters wedding. Everything was perfect. Plenty of room for all. The porch is fantastic and location is ideal for walking into town. I am so happy you enjoyed your stay! Beautiful,clean, comfortable and spacious home! We just came back from our stay in Jamestown. I love this house! It is the perfect location to walk to the beach. The yard is private, perfect for kids with swings and slide. The front porch is so pretty with ceiling fans and rockers. We ate our meals on the porch with seating for 8. Katherine is quick to respond and very helpful with any questions. It was our first time vacationing in Jamestown and we loved it. We plan on going back next summer! Great location - only a few minutes from a grocery store. House was very clean. Beds all very comfortable. Charming decor. The gorgeous claw foot tub has a hand held shower attachment. Perfect for our group of friends and family. The owner is responsive and easy to talk with. Very much recommend. And Jamestown.. is wonderful. Perfect Spot for Rest and Relaxation - Highly Recommend! Let me begin by saying that the photos of The Sand Home do not do the house justice. Katherine really did think of everything in outfitting the home, from providing all linens (sheets, towels and beach towels), having a fully equipped kitchen, and recreational items (beach chairs, boogie boards, umbrellas, games, and bikes). Our group - 3 couples and 1 single (all adults) - felt the home provided ample private space for us to retreat when we wanted to go our separate ways, as well as ample communal space. We can definitely see how families with children would love it. The covered porch was a perfect setting for group meals (dining table seats 8) and just for relaxing on the rocking chairs and swing. Really great breeze in the mornings and evenings. All the bedrooms have A/C but we really didn't have to use it - the temperature dipped enough in the evening to just open the windows and let the breeze blow in. The home is only a 3 minute walk to Mackerel Cove - the premier swimming spot in Jamestown; 2 minute drive to the closest grocery store and 3 minute drive to the ferry to Newport. You really cannot find a place that is more perfectly situated. Katherine was great - provided very clear instructions for check-in and check-out and responded to emails we sent during our stay. The party before us checked out late, which delayed our check-in (Katherine was uber apologetic about the delay and wanted to take the extra time to make sure the house was ready for us - it was immaculate!). Katherine in turn allowed us to check-out an hour later at the tail end. Katherine also provided some great recommendations for local eats and activities. The one thing folks should note - the upstairs bathroom has a clawfoot tub which is better suited for baths and giving children a quick wash - all those in my group felt more comfortable using the shower downstairs (we have old knees and couldn't squat for too long). In sum, we had an awesome time, would definitely stay at The Sand Home again and would highly recommend the home to others looking for a wonderful place to get away from it all! The house was as advertised. It is very near the beach and enough room for all of us (6 adults and 2 toddlers). The house had a swing set and slide for the kids and an outdoor shower that came in handy after returning from the beach. It was easy access to Newport and to Narragansett. I would recommend it for a laid back vacation but with access to the rest of Rhode Island. We are from Houston and it was great to enjoy the cool weather. We stayed at this lovely cape in Jamestown for a few days while visiting family in the area in October. The house is well appointed and in a great location. My morning run was fantastic with amazing views along the water. Close to town. The yard was fun for our niece and the porch was a great spot to sit and relax. The owner included some restaurant reviews for local fare. We hope to stay there again as we didn't have enough time to explore Dutch Harbor and the parks and beaches.